Sedum pachyclados is one of the prettiest Stonecrops we have in the STEPABLES Creeping Perennial line! 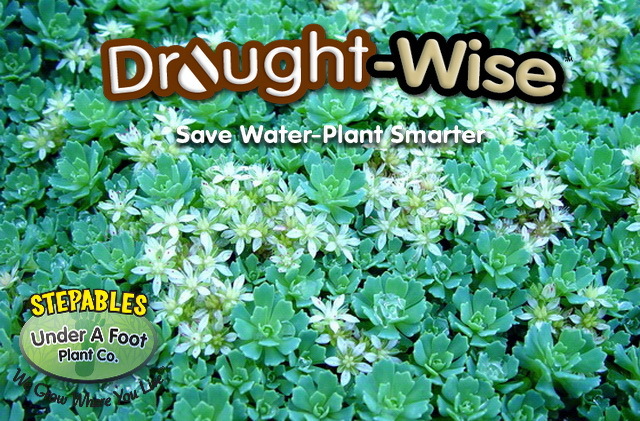 White Diamond Stonecrop has incredible blue-gray rosettes that form a perfect plush carpet on the ground. Tips are deeply serrated which seem to catch a drop of water and hold it up like a prized diamond. Small star-shaped white flowers cover in summer. 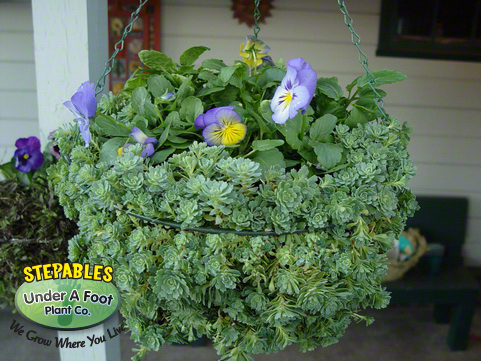 Perfect for rock gardens and borders and absolutely marvelous in a container. Sharp drainage is a must. Over watering will impair growth. Sedum pachyclados is a plant I stumbled across years ago hunting for new plants. I just thought it had the prettiest rosette foliage and the coolest green/gray color I had ever seen. However, once I watered it, that’s it became near and dear to my heart! Every drop of water bubbles up on top of those pretty rosettes like a diamond set on top of a gorgeous wedding ring. It is very stunning in the sunlight!! Place it someplace where you can see it sparkle! I have White Diamond Stonecrop draping over my giant bolders in my landscape and simply love it! It is really great as an outside edging plant on a patio or courtyard, and just at home in a rock garden. It even works great in a fairy garden for shrubbery!